Photo Gallery Tuesday " Grand Central Oyster Bar"
The Grand Central Oyster Bar opened in 1913, yes, it is 100 years old! I am a huge fan of fried oysters, I make my own at home, but had to try theirs to see what all the rave was about. They were quite tasty, and the serving was pretty generous too! I know most people either love oysters or hate them, but they are quite a tasty treat. I have yet to try them raw, one of these days I will attempt. If you like oysters, or seafood in general ( I so prefer that to steak) be sure to visit the Grand Central Oyster Bar. It is one of New York City's best landmarks. So.....are oysters on your dinner menu?? *Reservations accepted until 9:00pm, last seating at 9:30pm. The Grand Central Oyster Bar & Restaurant is conveniently located in the heart of Grand Central Terminal, NYC. MTA Metro-North Railroad, Hudson, Harlem and New Haven lines. 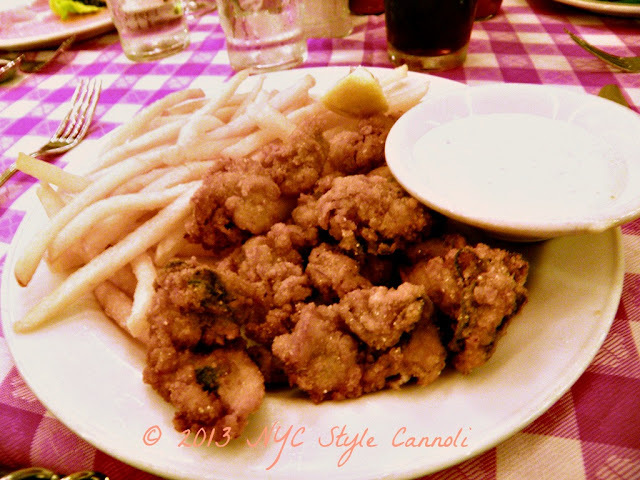 I'm not a huge fan of fried oysters, but I like knowing of different places in New York. I always get so lost in that city. Just trying to catch up after a few days away! I'm not a huge fan of oysters but I haven't had them served this way and they certainly look very appetising here. You can have any kind of seafood at the Grand Central Oyster Bar and you will be a happy person. I am still afraid to try them raw but I will one day! This is a classic NY place Miss B If you love seafood, a good stop while in the city for sure. I love friend oysters too, but I actually love them raw even more. You need to give them a try -- use lots of lemon juice -- I promise, they are delicious, almost like a cocktail.